While James Gunn’s Guardians of the Galaxy certainly does have its connections to the larger Marvel Cinematic Universe as we know it, those connections are actually rather thin in the grander scheme of things. The Avengers are palling around on Earth, and Star-Lord and his gang are on the other side of galaxy on their own adventure. Because it’s Marvel Studios, we are guaranteed to eventually see the two groups of characters meet up, but that’s years away (presumably in 2019’s Avengers 3). But will the upcoming Guardians of the Galaxy 2 create a stronger bond to Earth at all? According to James Gunn, the answer to that question appears to be no. The writer/director – who is basically just doing a victory lap at this point – was on hand at the annual DragonCon festivities in Atlanta, GA this weekend, and during a panel he did with his brother, he revealed something interesting about Guardians of the Galaxy 2. Asked if there was any chance that the film would possibly introduceCarol Danvers a.k.a. Ms. Marvel a.k.a. Captain Marvel to the Marvel Cinematic Universe, Gunn dismissed the idea by saying that he is trying to stay away from “Earthlings” in his quadrant of the movies. Instead, he wants Chris Pratt’s Peter Quill to remain the feature’s solid connection to our home planet. 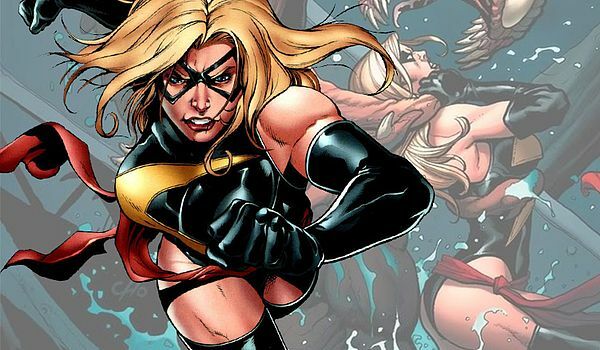 While he made it sound like Captain Marvel definitely won’t be in Guardians of the Galaxy 2, that wasn’t the end of what he had to say about the presence of female superheroes in Marvel Studios films. Collider says he that “he agreed that more than likely, Carol Danvers would appear sooner rather than later in the Marvel movies,” and added that there are plenty of woman characters from the Guardians of the Galaxy roster to single out and highlight. While it’s a rather unspecific promise, the director says that the plan is to “introduce new female characters into the world ofGuardians as soon as he [can].” That just means Guardians of the Galaxy 2, right? Gunn certainly has a strong base to work from. Zoe Saldana’s Gamora proved to be a strong presence in the first Guardians of the Galaxy, and there is plenty more room to explore (particularly in her relationship with Thanos). There is also, of course, Gamora’s “half-sister” Nebula, played by the fantastic Karen Gillan. It’s already been confirmed that both will be back, so the question becomes who else can he add? Characters like Angela, Mantis, Martyr and Moondragon are all realistic options for the sequel. Guardians of the Galaxy is continuing to tear it up at the box office, and this past weekend it became the highest grossing domestic release of 2014 (edging out fellow Marvel Studios movie Captain America: The Winter Soldier. Having seen the film more than a few times in theaters myself, I would highly recommend giving it a second or third go-round if you haven’t already, preferably on the biggest screen you can find.